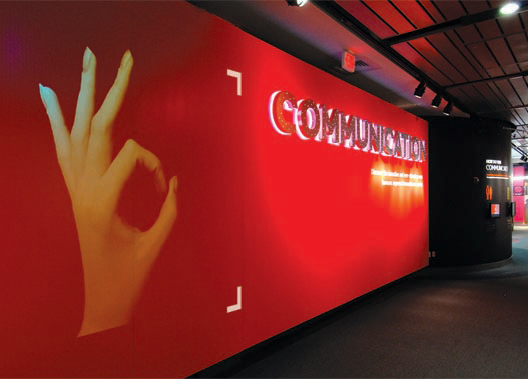 Communication exhibition uses an environmental narrative approach and hands-on activities to disseminate the content. This exhibition incorporates full-body immersive environments, electromechanical and multimedia interactives in four themed content zones: Body and Language; Symbols, Signs and Writing; Digital Media and Content; Signals and Networks. The four content zones are clearly delineated by color-coding. Subtle kinesthetic cues were given to direct visitor's progression through a generally linear narrative path, meanwhile allowing the visitors to make their own choices of what experiences to partake. Exhibit elements that are repeated throughout the galleries give the entire exhibition a contemporary, high-tech look: tubular metal support structures, over-lifesize human imagery on graphic panels of various translucency. Theatrical lighting techniques and visual layering are used extensively to give images unexpected juxtapositions and to give texture and subtly convey multiple and layered meanings. Visitor's walkthrough reveals a procession of spaces alternately intimate and public, evenly dispersed with experiences of intensity and lightheartedness, movement and rest, action and thought, fast paced and lingering. Changing projection of gestures of human communication.